Back in 2014, Retefe banking trojan started to appear in the news. First appearance in public was in a blog post from the Microsoft Threat Research & Response team. Then in July 2014, David Sancho from Trend Micro wrote the first public report about it. A video from Botconf about this research is also available here. Following that a great write-up by Daniel Stirnimann from SWITCH-CERT is here and here. Time as passed and the threat actors behind Retefe continue to evolve and adopt new techniques to commit fraud. In the past, Retefe has maintained a low profile when compared with other Banking trojans. It is known to target users in Sweden, Austria, Switzerland and Japan. Retefe is an interesting banking trojan because is designed to bypass the two-factor authentication scheme (mTAN) used by different banks by encouraging the victims to install a fake app. mTANs (Mobile Transaction Authentication Number) are used by banks as a second factor authentication. 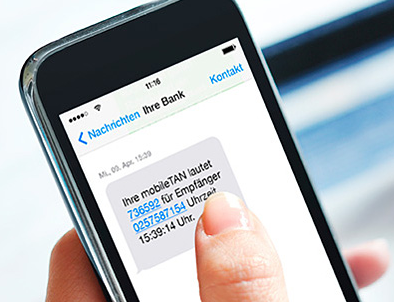 When the user tries to login to the bank or perform a transaction a SMS is sent to the user’s mobile phone. Retefe is then able to hijack the SMS’s. The threat actors behind the Retefe malware use phishing emails as main infection vector. The emails are tailored to match the country that they are targeting. In Switzerland for example, the lures take advantage of social engineering techniques by impersonating institutions like Zalando and Ricardo to trick the users into executing the malware. One recent phishing campaign contained a ZIP with a malicious executable inside (SHA1 : 32ed8fb57e914d4f906e52328156f0e457d86761). The image below illustrates one of these emails. 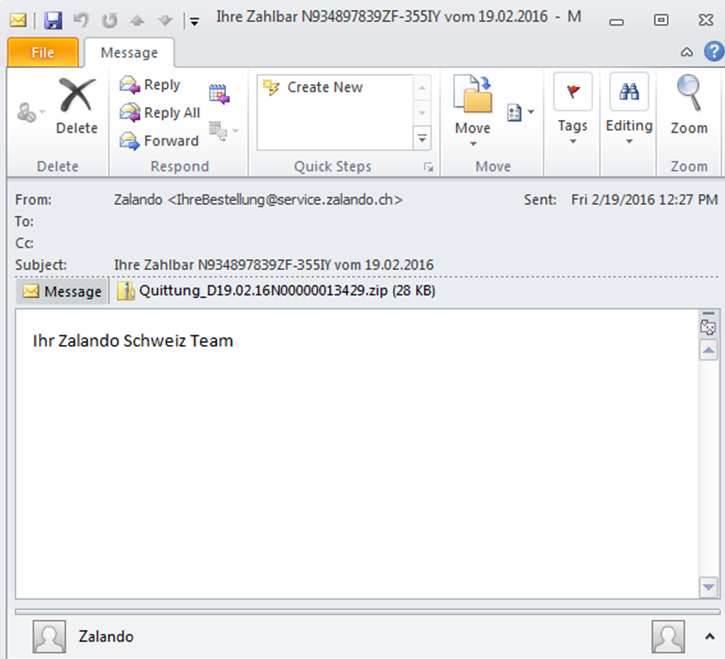 The sender falsely mimics a legitimate business transaction from Zalando. 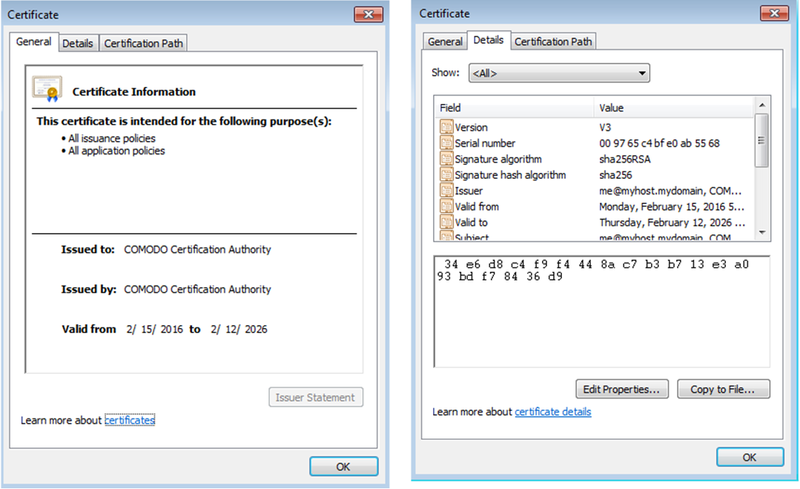 When installed, the Retefe Trojan adds a self-signed certificate authority (CA) root certificate to the victim’s browser certificate store. In this version the operation occurs in memory and the certificate is written to the Registry Key HKEY_CURRENT_USER\Software\Microsoft\SystemCertificates\Root\Certificates\<random number> where random number matches the Thumbprint of the certificate. This technique allows the threat actor to perform man-in-the-middle attacks and intercept or modify information from the banking site. The below picture shows the self signed certificate used in this campaign. At execution the first request is a HTTP request to checkip.dyndns.com or icanhazip.com in order to determine the victim public IP address. Interesting the request does not have an User-Agent. The IP addresses value returned is then used to append to another request which is used to retrieve the Proxy PAC config that is written to HKEY_CURRENT_USER\Software\Microsoft\Windows\CurrentVersion\Internet Settings\AutoConfigURL setting in the registry. This setting modifies the victim browser Proxy-PAC setting that allows the traffic to be redirected to a malicious proxy server. After deobfuscation we can see the hosts that are being targeted. With this configuration all the traffic that matches the targeted Swiss Banks will be redirected to a SOCKS proxy which is hosted in Russia. The redirection only occurs if it meets the conditions from the Proxy-PAC file. Otherwise the traffic is forwarded without the use of the SOCKS proxy. When browsing the internet, if the traffic matches one of the hosts defined in the Proxy-PAC configuration file then the traffic gets redirected to the SOCKS proxy. This will allows the threat actors to intercept and modify all traffic at will. 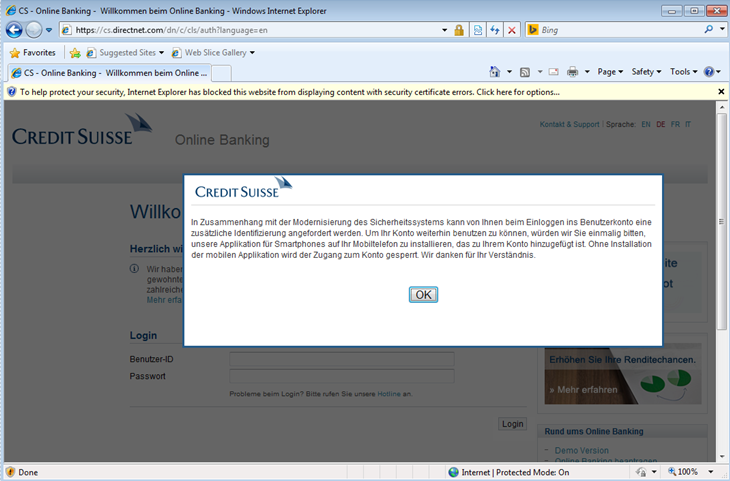 When browsing to the login page of one of the banks targeted in this campaign, the victim lands on a phishing page that mimics the bank web site and prompts the user with a pop-up message. This message attempts to lure the users that the appearance of the online banking site has been renewed and new features are waiting to be discovered! After clicking OK the user is prompted to enter his credentials. 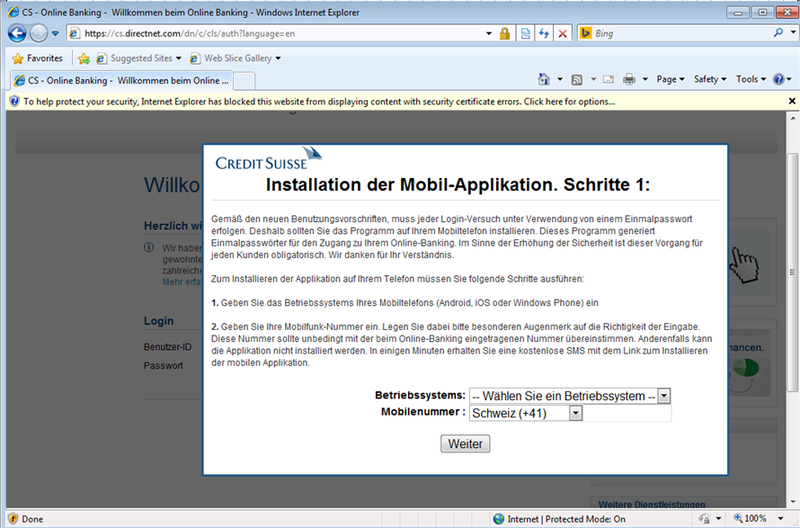 Then the user is presented with a pop-up message asking him to wait – behind the scenes the credentials are sent to the threat actor. The user is then prompted to confirm what type of second factor authentication he currently uses. He can choose SMS or RSA token as second factor authentication. Following the selection of SMS as second factor authentication the user is asked about his mobile phone number and mobile operating system. Current version of Retefe only targets Android phones. After entering a mobile phone, the user will be prompted to install a new banking mobile application. The victim will receive a SMS on his mobile phone asking to install the new APK. The APK is hosted on a site owned by the threat actors. 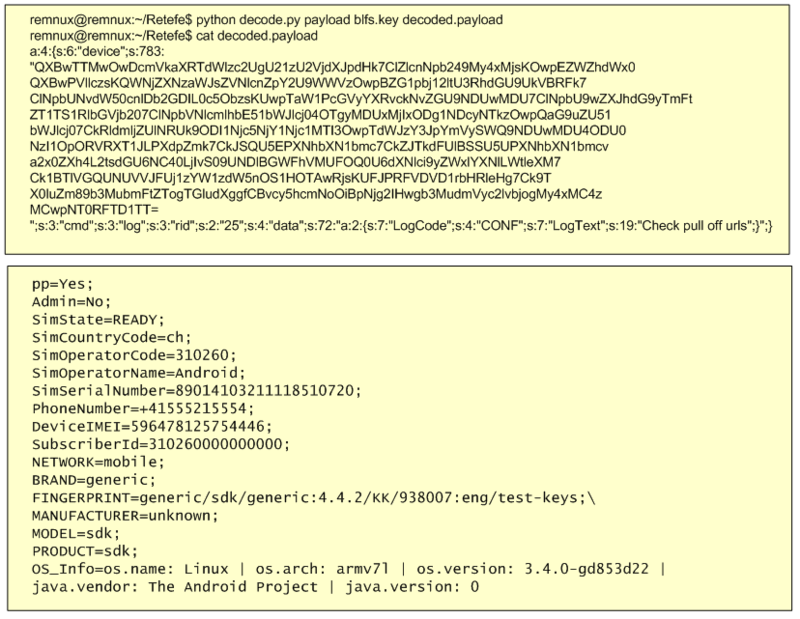 One example of an APK is CreditSuisse-Security-v-07_02 1.apk (sha1: 4bdc5ccd3e6aa70b3e601e1b4b23beaf09f33d7a). 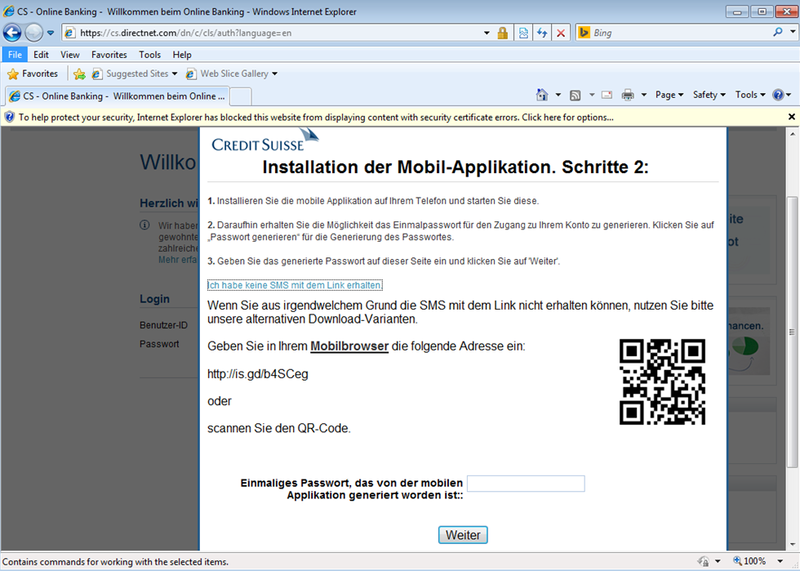 If for some reason the victim does not receive the SMS, then a screen is shown in order to encourage the installation of it using a QR code. 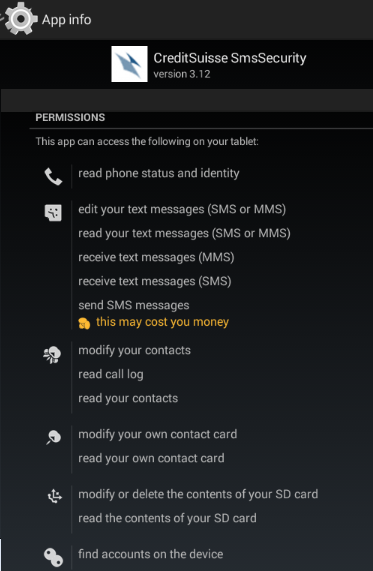 Installing the Android app allows the attacker to gain full control over the victims phone and among other things hijack the SMS’s sent by the Bank and take control over the users online banking session. The picture below illustrates the initial setup screen of the APK installation. The code, functionality and the C&C protocol of the APK has been researched extensively by Angel Alonso-Párrizas in a series of articles including here, here and here. The APK is an adaptation of the Signal Android APK (a.k.a. Text Secure) from Moxie Marlinspike. Among other features allows one to store and send encrypted text messages. The figure below shows some of the permissions that are granted to this malicious APK. In this case the threat actors reused the code from Signal Android to implement the the Command and control (C2) communication. The traffic uses the Blowfish symmetric algorithm. It communicates with a primary C2 and if it fails it tries a backup address. The C2 addresses are stored in file named config.cfg which can be found in the decompiled APK. The data stored in the config.cfg and the traffic can be decrypted with Blowfish in CBC chaining mode. The key and IV used is also stored in the APK. The picture below shows the decrypted configuration file which contains the addresses of two compromised servers that are used to then communicate to the Retefe backend. As soon as the APK is installed and launched it starts beaconing out to the C2 address. The C2 traffic is encrypted using the Blowfish encryption algorithm, and the traffic uses HTTP. The encrypted information contains details about the victim’s mobile device, including the SIM country, operator, serial number, IMEI, phone number, model and brand. The below figure shows the decrypted traffic. In this decrypted traffic there is a block of base64 data which decoded will give the mobile device information. Meanwhile, in the banking session the user is asked to enter the OTP (One Time Password) code seen in the fake mobile app. From this moment onward the threat actors are in possession of the username, password and mTAN which allow them to commit fraudulent payments. In addition they have control over the victims mobile phone and can send real-time instructions via SMS. See Angel’s article here and TrendMicro here about the different SMS C2 commands. This particular malware can be identified by the home users when they are browsing to the Banking website because it breaks the EV SSL certificate seen in the browsers. This does not occur with other types of banking malware. The Counter Threat Unit from Dell SecureWorks just recently released the “Banking Botnets: The Battle Continues” article that contains about the top banking malware seen in 2015. Moving from the traditional internet banking to a more mobile experience is a fast growing trend. This will fuel the adoption of new techniques by the threat actors in order to leverage the digital channels to commit fraud. Banking trojans are sophisticated threats that leverage technology and social engineering and are here to stay! Phishing campaigns that distribute banking malware are common and ongoing problem for end users and corporations.E-mail continues to be the weapon of choice for mass delivering malware. The tools and techniques used by attackers continue to evolve and bypass the security controls in place. From a defense perspective, the US-CERT put together excellent tips for detecting and preventing this type of malware and to avoid scams and phishing attempts applicable to home users and corporations.